Trying to hold thoughtful discussions in D.C. about public policy amidst the drama of late night Tweets, surprise retirements, and FBI raids is no small feat! 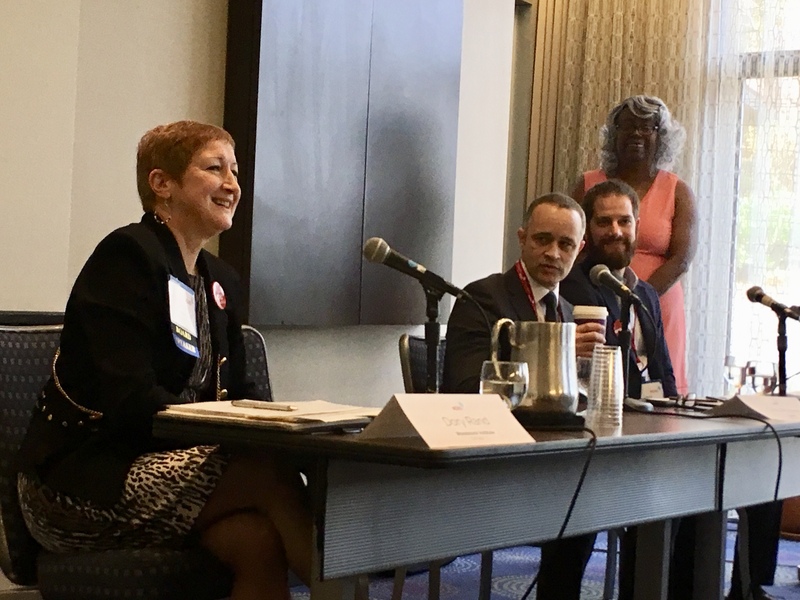 But from April 9 through 11, Woodstock joined advocates across the country at the National Community Reinvestment Coalition’s (NCRC) Just Economy Conference to focus in on community reinvestment developments, practices, and policies. The conference reminded us and our allies that despite the current wave of overwhelming political change and instability, we’re not backing down. We’re here for the long haul in the fight for financial justice. The Illinois delegation included members from Woodstock Institute, Illinois State Black Chamber of Commerce, Far South Community Development Corporation , Northwest Side Housing Center, Neighborhood Housing Services of Chicago, Cook County Land Bank Authority, IFF, Universal Housing Solutions CDC, Chicago Community Loan Fund, Spanish Coalition for Housing, The Resurrection Project, Accion Chicago, Friends 4 Life Covenant Church, Chicago Urban League, Latin United Community Housing Association, and Economic Growth Corporation, among others from financial institutions and real estate companies. This year’s NCRC conference was larger than ever, drawing a crowd of over 1,100 NCRC attendees, including community organizers, academics, policymakers, small business owners, financial institutions, and advocates from various housing and economic development nonprofits. The delegation from Illinois was among the largest. Woodstock joined the Illinois State Black Chamber of Commerce, Far South Community Development Corporation , Northwest Side Housing Center, Neighborhood Housing Services of Chicago, Cook County Land Bank Authority, IFF, Universal Housing Solutions CDC, Chicago Community Loan Fund, Spanish Coalition for Housing, The Resurrection Project, Accion Chicago, Friends 4 Life Covenant Church, Chicago Urban League, Latin United Community Housing Association, and Economic Growth Corporation, among other partners who attended from financial institutions and real estate companies. An amazing Hill Day from the Illinois delegation, with 12 visits to Capitol Hill offices of Congressional leaders from both parties, seven of which included face time with the Member of Congress him/ herself! Illinois far surpassed any other state in terms of the number of Hill Day visits. Two days of seminars on community revitalization strategies and techniques, including courses on the Community Reinvestment Act, access to bank branching, gentrification, data, community organizing, fintech, racial and gender equity, and aging in place. These courses included a panel on the “Role of Branch Banks and Technology in Expanding Bank Services” and a presentation on financial technology (fintech) innovation (“Are You Ready for the Fintech Revolution?”) that featured our President, Dory Rand. Woodstock Institute President Dory Rand speaks on a panel about fintech innovation with Chris Massey of Square and Louis Caditz Peck of LendingClub, moderated by Stella Adams of NCRC. A powerful keynote from Rev. Jesse Jackson Sr., who recounted the assassination of his friend and fellow civil rights leader Martin Luther King, Jr. 50 years ago at the Lorraine Motel, connecting their legacy to the ongoing fight for financial equity. Forging new relationships with offices outside our realm of traditional allies and promoting bipartisanship while also engaging our allies in new ways. 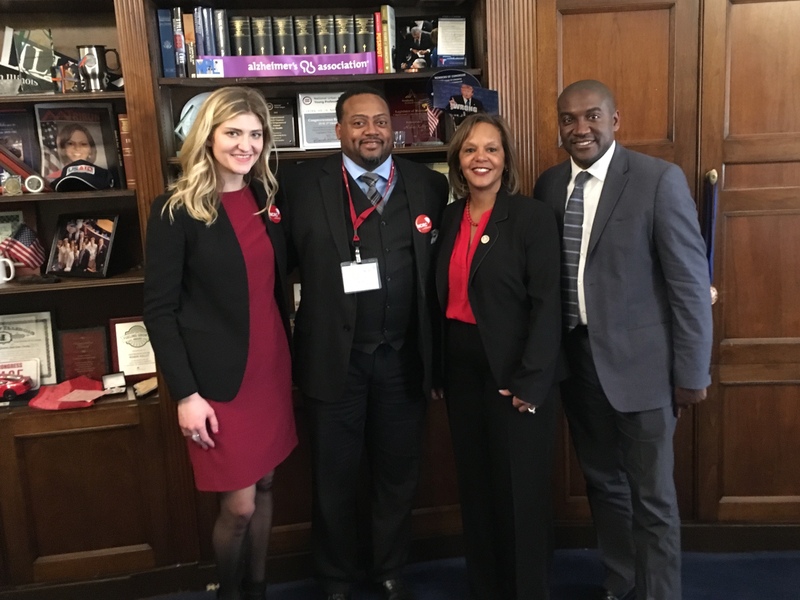 We’re excited that members of the Illinois State Black Chamber of Commerce, which recently became an NCRC member, attended the conference and were active participants in Hill Day. The announcement of leadership changes within NCRC: John Taylor, President and Founder, now co-leads NCRC with his former assistant Jesse Van Tol, who was promoted from NCRC COO to CEO. A speech from Square Capital’s Jacqueline Reese, who explained that Square Capital fills a vital market need with their loans to small business customers who use Square payment technology averaging around only $6,000. She said that 54 percent of Square Capital loans are granted to women—as compared to the national average of 18 percent, and 37 percent of Square loans are made to self-identified minority-owned small business—as compared to the 26 percent of traditional loans. 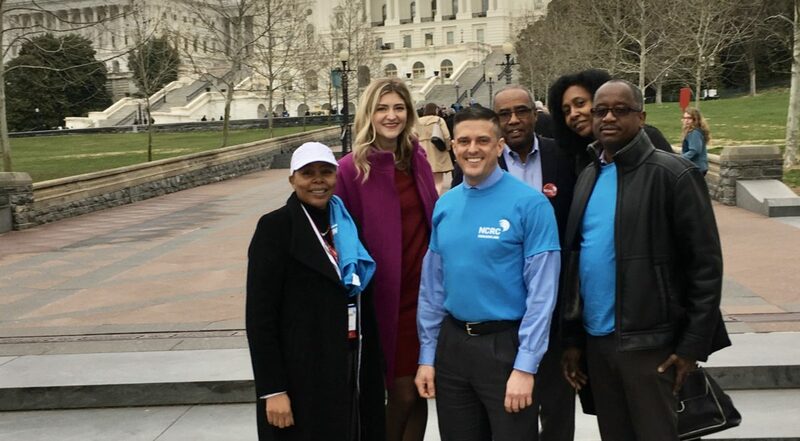 The NCRC Hill Day was an unqualified success for the Illinois delegation. 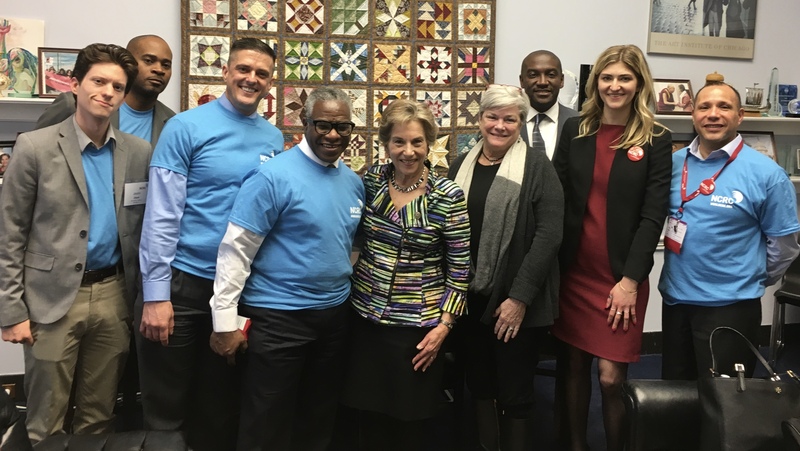 We met with both Republicans and Democrats, as we actively seek bipartisan opposition to Congress’ current attempt to repeal historic payday and title lending protections (via the Congressional Review Act on H.J. Res. 122). We met with the offices of Sen. Durbin, Sen. Duckworth, Rep. Hultgren, Rep. Quigley, Rep. Lipinski, Rep. Foster, Rep. Krishnamoorthi, Rep. Schneider, Rep. Roskam, Rep. Davis, Rep. Schakowsky, and Rep. Kelly. 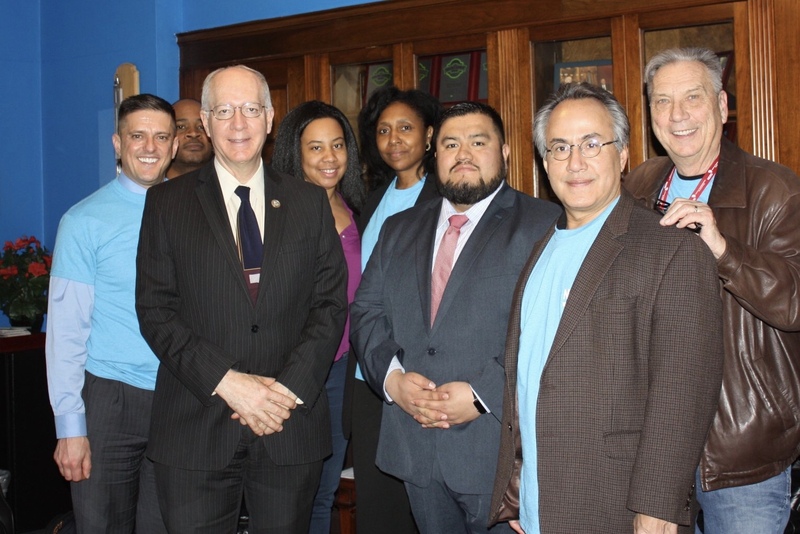 When the Illinois group arrived, Congressman Danny K. Davis welcomed the group in, quickly recounting previous meetings and shared connections within the community. When it came time to talk about the issues, Congressman Davis listened intently to our asks: 1) protect consumers by upholding the Community Reinvestment Act (CRA); 2) collect (and protect the collection of) HMDA data; 3) keep Freddie Mae and Fannie Mac’s affordable housing work alive; 4) shield important payday and title lending protections—designed to protect vulnerable borrowers from the debt trap– from Congressional repeal; and, 5) make adequate budget appropriations to serve the needs of low- and moderate-income folks. The Congressman’s reply was profound, answering our asks with a challenge of his own: “We need to do more,” he said. Congressman Davis recounted the creation of the Community Reinvestment Act, including his experiences with the Chicago activists, such as Gale Cincotta, who took community reinvestment from theory to the law of the land. He then proposed we work closely together in the future to engage with the people of the Austin neighborhood in his district, who can use the CRA as a tool for community self-empowerment. Some offices asked our Illinois delegates hard questions, or sought valuable information that was not readily available. 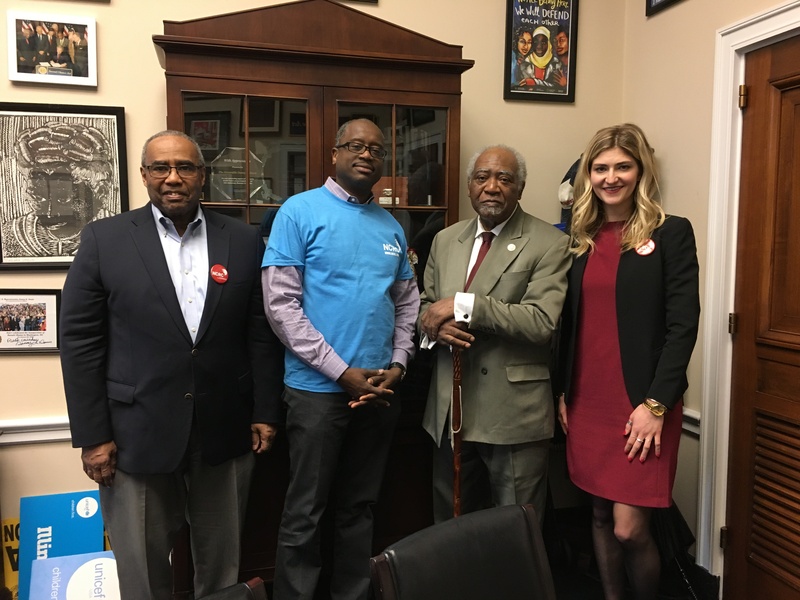 For example, one office requested that we identify Community Development Financial Institutions (CDFI) and CDFI-funded projects in the 6th district for the Congressman to visit. 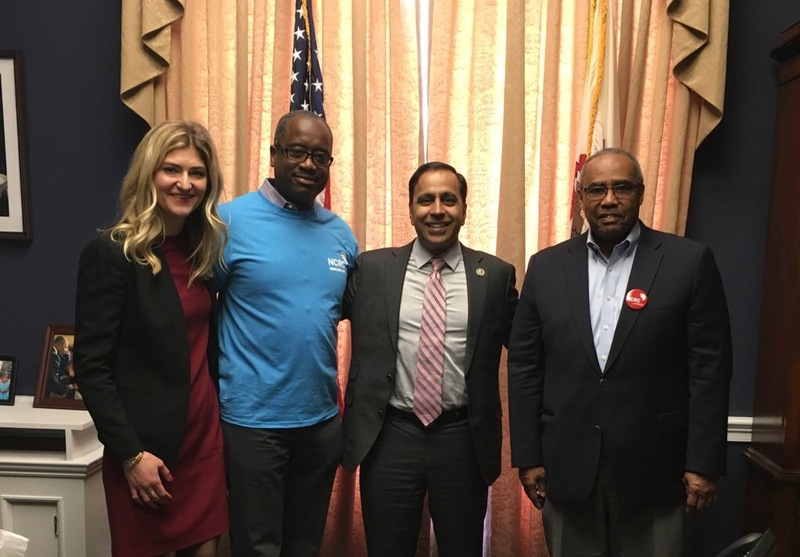 From left to right: Jenna Severson (Woodstock), Eric Williams (Far South CDC), Congressman Raja Krishnamoorthi, Phillip Snorden (Consumer Credit Counseling). 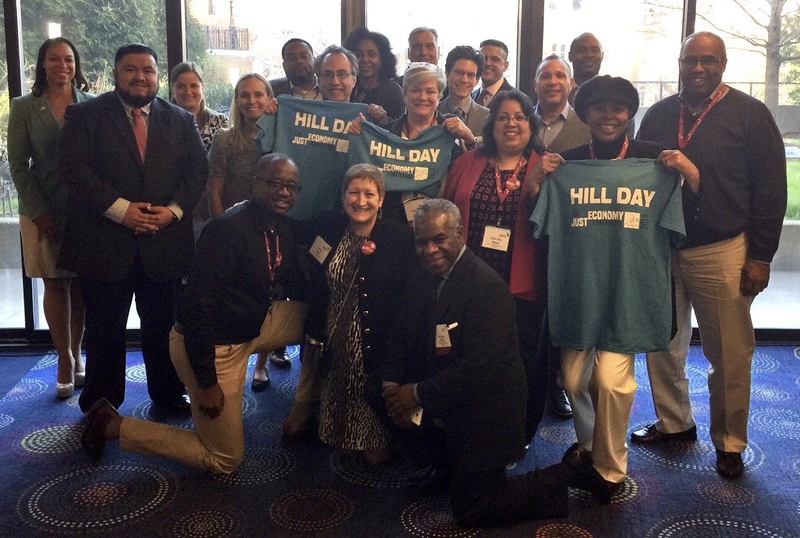 Despite a grueling day, the Hill Day participants emerged energized and better prepared to correct inequities in our financial system. Stay tuned to hear how these important issues develop, and how you can engage in future collaborative opportunities!